brctl stands for Bridge Control. In Linux, this command is used to create and manipulate ethernet bridge. This is typically used when you have multiple ethernet networks on your servers, and you want to combine them and present it as one logical network. For example, if you have eth0 and eth1, you can combine them and present it as just br0, which will inturn use both eth0 and eth1 for network traffic. Using brctl addbr, we can create a new ethernet bridge. In the following example, we have created three ethernet bridges on this server: dev, stage and prod. Please note that at this stage, this is just an empty ethernet bridge which doesn’t have any other ethernet network on it. Please note that this brctl is bit different than the Linux EtherChannel NIC bonding that we discussed earlier. Using brctl show, we can view all available ethernet bridges on your server. The following example will display all the current instances of the three bridges that we just created. If you notices the last column “interfaces” has nothing on it. This means that none of this bridge currently has any ethernet device associated with it yet. Using brctl delbr, we can delete an existing ethernet bridge. The following example will delete the “stage” instance of the ethernet bridge. As you see from the show command, we don’t see the “stage” ethernet bridge anymore. Please note that when a bridge is active (i.e up), you can remove it. You need to first bring down the bridge and then delete it. Also, please note that earlier brctl command was called as brcfg. Using brctl addif, we can add an interface to an existing ethernet bridge. The following example will add the ethernet network eth0 to the bridge “dev” that we just created. Warning: Don’t try this on any critical machines, as you might loose network connection to that machine when something goes wrong. Try this only on a test instance where you have console access. This will really make the eth0 as a port of of the bridge “dev”. So, all the frames that arrives on eth0 will be processed as if it is really arriving at the bridge. Also, when the frames are sent-out on “dev” bridge, it will use eth0. When multiple interfaces are part of “dev” bridge, then eth0 will be a potential candidate to sent-out the outgoing frames from the bridge. After adding the eth0 to “dev” bridge, the brctl show command will display the following. As you see from the above output, the last column “interfaces” how has eth0 for “dev” bridge. Note: If something goes wrong while adding eth0 to the “dev” bridge, execute the following command from the console to delete the dev bridge. As you can imagine, you can’t add an interface that doesn’t exist on the system to the bridge. 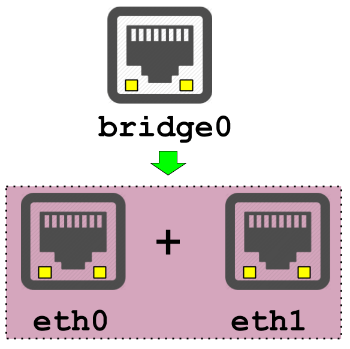 In the above example, we added only one ethernet device (eth0) to the bridge. But, the whole idea of using a bridge is to add more interfaces to the bridge. In the following example, we are adding both eth0 and eth1 to the bridge “dev”. As you see from the following output, for the dev bridge we see two lines. In the last column “interfaces”, we see both eth0 and eth1 for “dev” ethernet bridge. Note: If a particular ethernet interface is already part of a bridge, then you can’t add it to another bridge. Basically, one network can be part of only one bridge. If not, we’ll get the following error message when trying to add it to another bridge. Using brctl showmacs, we can see all the learned MAC addresses of a bridge. In the following example, as of now, the following are the two mac addresses that connected to the ethernet bridge “prod”. This data will keep changing depending on the current status of what is connected to the bridge. In the following example, we are setting the mac address ageing time to 120 seconds on “dev” ethernet bridge. So, if a frame is not seen for “dev” bridge in 120 seconds, then “dev” bridge will delete the mac address from the forwarding database. Using brctl stp, we can setup spanning tree on ethernet bridge. But default, spanning tree is not enabled when we create a bridge. Spanning tree is helpful when you have multiple bridges on your network, and they can all collaborate to find the shortest path between two ethernets. In the following example, we are turning on the spanning tree on “dev” ethernet bridge. We can use either on or yes to enable spanning tree. So, both of the following command will do exactly the same. As you see from the following show output, the values in the “STP enabled” column for “dev” bridge is now “yes”. STP stands for Spanning Tree Protocol. Once you’ve enabled stp on your bridge, you can use showstp as shown below to view all the stp parameter values of your bridge. The following will display the stp parameter and its current value for “dev” bridge. The spanning tree parameter default values for a specific bridge can be changed. You can also change other parameter values of the bridge that you created. The following table displays available set commands for brctl. The time value is in seconds. I’ve never used a bridge to bond interfaces, but have been using them for years to provide networking to virtual machines. Bridge vs bonding with link aggeration? In this sbridge setup there’s no lacp mode setup needed on the switch right? What about performance?